Here’s what we’ve been looking for—simple crackers or cookies that taste good, are super-easy, and super-low in carbs. These are substantial enough to use with dips or spreads and the variations are limited only by your imagination. the crisps, like a flat meat pounder or a measuring cup with a flat bottom, and some plastic wrap. Whisk egg white until blended. Add remaining ingredients and mix well. Form dough into 48 small balls. They should be about ½-inch across. Place balls about 3 inches apart (to make room for tool used to press crisps) on parchment lined pans. Cover with a sheet of plastic wrap and flatten balls into thin circles, roughly 2 inches across, with a flat implement. Carefully remove plastic. Place in preheated oven and bake for about 10 to 12 minutes or until golden brown and crisp. Repeat with remaining balls. Store in an airtight container. Tip: I used the bottom of a measuring cup to flatten my crackers. Any flat implement will do. Gourmet crackers to serve with soups or dips and spreads. They taste like Pringles! Make basic Almond Crisps, above. Add 3 tablespoons (⅜ ounce) of finely grated Parmesan cheese and a dash of freshly-ground black pepper to mixture. Sprinkle crisps with coarse salt before baking. You will be tempted to eat these like chips. Make a few at a time and refrigerate the remaining dough to help with portion control. Make according to directions for Almond Crisps, above. Parmesan, Variations, Very Low Carb. Bookmark. You are welcome, Judith. Thanks for the comment! Judy–Made these this morning and they turned out great. Do you just dip and form the ball with a spoon, or do you use a cookie dough scoop? If so, what size? As the dough is very sticky, just trying to figure out the easiest way to do this with my next batch! Thanks for the recipe! Hi Brad. I just scoop up a bit with a spoon and roll it in my hands. If you get about 48 they are the right size. Each ball should be 1/2 inch or so across. Smaller than a marble, larger than a pea? Okay. Good instructions. I made my first batch with too much dough per cracker, so I will make the dough balls smaller next time. However, even making them a bit too thick, they still turned out great. Probably not as crispy/crunchy as they should have been. Tried them with chicken liver pâte, which is thick, and the crackers held up well. Thank you for the recipe! Brad Dawkins: it is a very forgiving recipe. I made them small mostly to keep the carbs very low. They would probably be good even if they are thicker. Glad you like them! Judy, I was wondering if the one egg white is the only liquid in the recipe, and if you need to oil the pan you bake them on? Thank you for your contributions! Yes, L wells, the egg white is the only liquid. 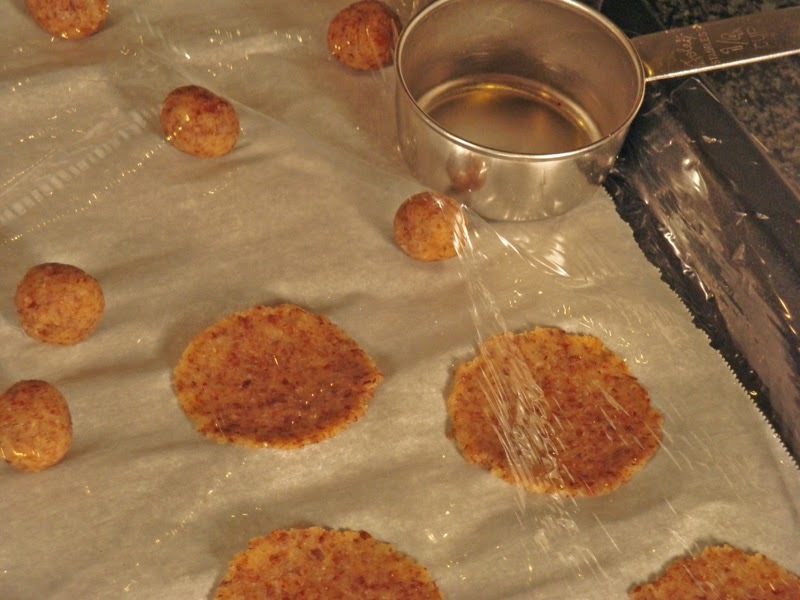 And you don't need to grease the pan if you use parchment paper. The paper makes them easy to remove without breaking. Pick up the paper and they will pop right off. I would like to try these but I am confused as my measuring cup states that one cup is 8 oz…so I am seeing a conflict…can you clear this up for me? Are we talking like a 4 oz tea cup instead of a measuring cup? Brianna, an ounce can be a volume or a weight measurement. One cup of water is 8 fluid ounces, but one cup of almonds actually weighs 4 ounces. Judy I was wondering if the egg white is the only liquid in the recipe, and if the pan needs to be oiled. Thanks so much for your contributions to low carb healthy eating. Judy, thank you for the recipe. Can you tell me how many crackers is considered one serving? An amount that would be under 100 calories? I.e. 14 calories each, so approximately 7 crackers? Thanks again. Hi Maureen! The nutrition data is per cracker/cookie. They are only 0.2 net grams each, so you can have 5 for only one gram of carbs!